Fiat India has brought an attractive offer named 5×5 for its new customers. With this new scheme any new Fiat customer can avail the Fiat 5×5 offer benefits. 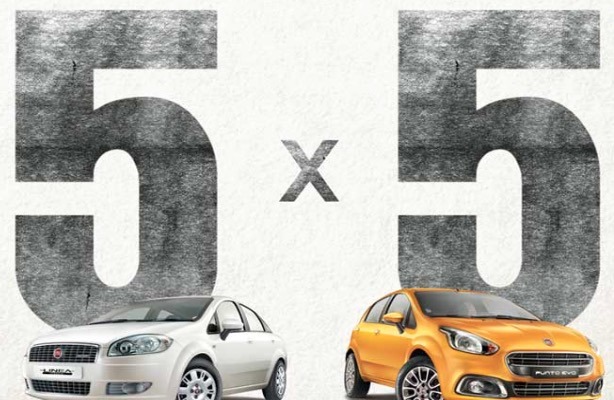 The 5X5 offer from Fiat is available on all range of cars from Fiat including popular car models like Fiat New Linea, Linea Classic, Fiat Avventura and Fiat Punto Evo. The 5 year warranty scheme though is pretty exciting and unique from Fiat, this is not the first time by a brand – even Honda has introduced extended warranty for more than 5 years ( 7 years) in the past, same with Skoda Rapid. You can fill out your details on Fiat website’s link to schedule a test drive of Fiat New Linea, Fiat Linea Classic, Fiat Avventura or Fiat Punto Evo.